Remembering Deborah L. Richardson | Remembering Deborah L. Richardson | De Soto Obituary Search | Dietrich-Mothershead Funeral Home, Inc. Remembering Deborah L. Richardson | De Soto Obituary Search | Dietrich-Mothershead Funeral Home, Inc.
Visitation: Thursday, April 11, 2019 from 5:00pm until 7:00pm at the Dietrich-Mothershead Funeral Home. Deborah Lea Richardson was born in De Soto on March 4, 1953 a daughter to Robert Henry and Virginia (nee Hayes) Richardson. 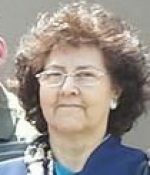 She died at her Festus home on April 6, 2019 at the age of 66. She is survived by her sister Sandra Gulledge, Hillsboro, nine nieces and nephews; several great nieces and nephews; a dear friend Sharon Foster, Ballwin and two brothers-in-law: Richard Wright, Columbus, GA and Charles Caldwell, De Soto. She is preceded in death by her parents; two sisters: Dorothy Wright and Bobbie Caldwell; and one brother-in-law Gary Gulledge. Debbie had worked as a draftsman for local engineering companies and most recently in the Pharmacy at the Festus Wal-Mart.